I have a list of favourite authors. Currently on that list are writers like L.J Smith, Jennifer L. Armentrout, Richelle Mead and Cynthia Hand - Tahereh Mafi is now also on this list. Look at the cover. It's so pretty. I can't get over how beautiful it is. It would've been impossible for me to spot Shatter Me in a bookstore and not pick it up. I could sit and fangirl over the cover itself. I had really high hopes for this book when I picked it up. Tahereh Mafi is a beautiful writer. I understood everything she had written and whilst reading the book, there were certain parts I just had to reread over and over again - I still do. For instance, the beginning of Chapter 11. It was written in such a unique way and everything was described so well - you'll see when you read it yourself. There aren't that many authors out there who can write like she does. Julietter Ferrars is a 17-year-old girl. I get really annoyed nowadays because almost every YA book I read has the main character as a 16-year-old. I know, it's a really childish thing, but I can't help myself, it's like one of my pet peeves. Can't the she be a 15, or a year or two older? So you can imagine by happiness at finding out that she's 17. Juliette seemed really lost and empty in the beginning, but as a reader I loved seeing her transform into someone more confident. For those of you out there who haven't read this book yet: what are you still doing? Go! Buy it! 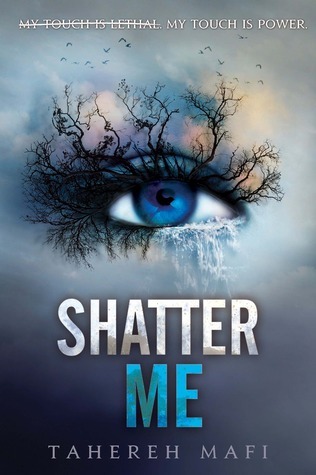 Shatter Me is a book you stay up late reading - I did. And you won't regret it, either. 5/5 stars - Books like this one make me love the dystopian genre even more. Oooh Shatter Me was one of my fave Dystopian reads! The crossed out words were so unique! Glad you enjoyed it as much as I did. :D Great review! It was! Mafi's such a good writer!